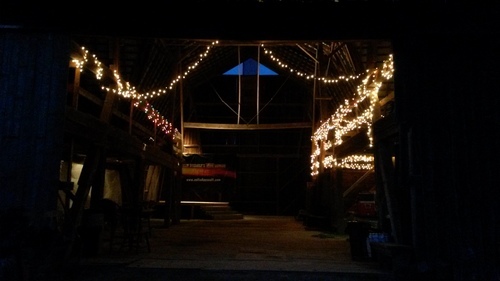 This year the barn party will be on September 16. We plan to eat between 5 and 6. Colin begins to play between 7:30 and 8. Every September we have a barn party that is open to the public with a live band, Colin Dussault and the Blues Project. If you’ve never heard them, don’t wait till September but go to their website to check their schedule and look forward to a wonderful evening! Colindussault.com. This tradition began in 2006 when I had stage three breast cancer. We had been going to hear Colin and the band for a couple years, and the first time I left the house after my surgery was to the Main Street Cafe in Medina to hear them. Fred asked if they would play here at the house for our family and friends to encourage me through chemo and my recovery. We have made it an annual event, and invite everyone. The last few years we have had over 200 people each night. We ask that everyone bring meat to grill, 2 dishes to share, their own beverage and chairs. We provide plates, napkins, and silverware. It’s a perfect recipe as it works well if 50 come or 250.